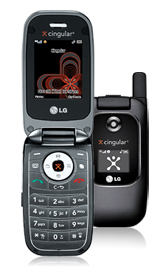 Cingular has launched the LG CU400, a relatively low-end handset that also features 3G connectivity. Previously Cingular has kept 3G for more expensive handsets. Even with the limited feature set, the CU400 is still compatible with Cingular Video and MobiTV. Cingular is selling the CU400 in 3G markets for $29.99 after a 2-year contract and $50 mail-in rebate.